With the Spring season in April comes an intriguing Mentor of the Month story that’ll inspire you to turn a new leaf and get involved yourself! 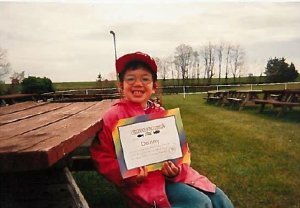 Danielle is our April Mentor of the Month—but not just that, she was a Little Sister throughout her childhood! Danielle is an advocate for volunteerism and a first-hand account of the positive impact that Big Brothers Big Sisters has on the lives of people, both youth, and volunteers. Like all families, ours was a busy home. My dad passed away when I was 6, after that my younger sister and I kept my Mom very busy. BBBSWR was a big help to our whole family, both my sister and I were matched with Big Sisters. I’ve always been a Type A person and as a child I really struggled to cope with the stress that came from grieving the loss of my father and the pressure I would put on myself to do everything perfectly. For me, my time with my Big Sister was an escape, a safe space for me to just be a kid and have fun. It was something that was completely my own, separate from stresses at home or school. With both my sister and I being in the program, whenever one of us was out with our Big Sister the other would have some special one on one time with our mom! This was another incredible impact of the Big Sisters program. I would have a hard time picking a favourite from all my fond memories of being a little. Something that stands out are all the crafts we would work on. I loved planning our crafts, gathering our supplies, creating something and learning new skills. Most of all I enjoyed the friendship we built in the process. 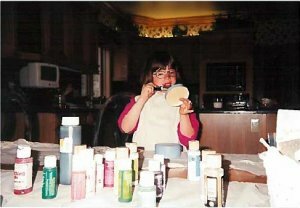 Many of the arts and crafts we did together have become life-long hobbies. I see these hobbies as a special gift from my Big Sister. 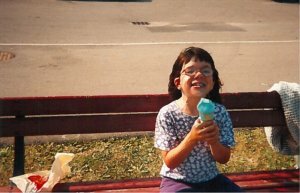 I also loved visiting Waterloo Park and going for ice cream, another life-long love of mine. Carrying her past as a Little Sister into her University years, Danielle wanted an avenue to pay it forward and became an In-School Mentor through Big Brothers Big Sisters of Hamilton in 2011. “I wanted to bring more balance to my life and have some fun! While in University I chose to become an In-School Mentor. Getting involved in the community, meeting new people, and getting out of the ‘University Bubble’ helped bring more balance to my life.” Five years later she joined us at Big Brothers Big Sisters of Waterloo Region and became a Big Bunch Mentor until she finally switched to the One-to-One Mentoring program and became a Big Sister herself! 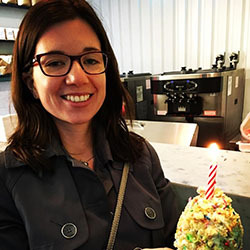 “Connecting with others in the community helps me to keep a fresh perspective, re-evaluate my beliefs and brings unique opportunities and experiences. On our first outing my Little and I went bowling. I had been a bit nervous, what if my Little didn’t enjoy the activity we picked or if she didn’t feel comfortable with me? It didn’t take long for those nerves to dissipate; our match was off to a great start! Our bowling games went quickly so I asked my Little if she would like to go somewhere to get a snack and go through the list of activities BBBSWR had given us. She suggested the Starbucks by her home. This happened to be a spot where I had gone with my Big Sister when I was a Little. We had lots of fun discussing our interests, planning activities we could do in the future and browsing through Chapters. It felt very special to be making new memories with my Little in a place where I already had fond memories with my Big Sister. It doesn’t stop with becoming a Big Sister herself, Danielle continues to find ways to get involved herself and encourage others to get involved as well, having recently reached out to her employer about participating in the Bowl for Kids Sake fundraiser. With the support of many customers, suppliers, friends, and family, Team AccuTemp raised over a thousand dollars for BBBSWR! Danielle is more than deserving of being our Mentor of the Month. Her story is incredibly inspiring and she continues to astound us; She inspires us to do more ourselves. We hope that the warm weather comes soon this Spring so that Danielle and her Little can get out to Waterloo Park and share their love of ice cream! We’ve asked Danielle to describe what Mentorship means to her (who would know better than her?) and we’d love to end off with her quote. To me, Mentoring is about forming a trusting and supportive friendship. This can mean exploring the child’s interests, trying new things, chatting about what is going on in their life, encouraging healthy behaviour, and building self-esteem. I want people to know that mentorship is not about filling a void or fixing something in a child’s life. It’s about adding to their support network and having fun. Every child can benefit from mentorship.